It isn't just videos and gaming - long-running music streamer Rhapsody is also betting big on virtual reality. Rhapsody VR, an app announced by the service today, drops viewers right into a concert without the need for an expensive ticket or security pat down. Out now on iOS and Android, Rhapsody VR offers a prerecorded concerts optimized for Google Cardboard that teleports viewers right on stage with the artist. Moving around the smartphone in your hands is also an option for those without a VR headset. Rhapsody VR currently offers performances by artists such as Talib Kweli, Low Cut Connie, Sweet Spirit, Shannon and The Clams, The Blind Shake, and Flatbush Zombies, with the app promising to update with more artists every month. The studio producing Rhapsody's concerts is Visual, a VR-specialized company with experience in the music biz, having also worked for radio stations, orchestras, and the bane of Metallica, Napster. Chuck Olsen, Visual's co-founder and CEO, attributes Rhapsody's interest in VR to the prominence of 360-degree video, saying the medium is "emerging as an exciting way to experience music and entertainment." 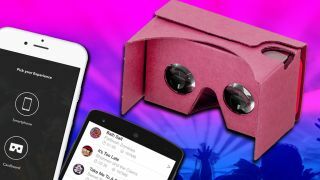 While the app is free, Rhapsody VR can still be resource-intensive, as each virtual concert needs to be downloaded to the device, rather than streamed. Deleting the setlist once you're done is easy enough, but just be sure to plan ahead before crowd diving into any cyber-symphonies.